If nothing’s gone wrong, what’s the need for health screening? There are those who argue that there is no point in doing a health screening test unless you know you have a problem. Some of these individuals are speaking only about a particular test, but others extend it to all of them: Hips, elbows, eyes, the various DNA tests, etc. The reasoning they give to support their stands varies. Some say they’ve never had a problem in their dogs so they don’t need to check. Others imply that anyone who does test obviously has issues. There are those who dismiss any screening test that doesn’t give black-and-white results. A few will shrug and observe that some health issues are already so common in the breed that screening won’t make any difference – or that others are so rare there couldn’t possibly be any reason for testing for them ever. The truth is there are no lines or even individual dogs that don’t have the potential to produce some sort of health issue. This isn’t meant as an indictment of purebreds; there aren’t any mutts out there that don’t have a few “bad” health genes, either. Same goes for you and me. For breeders, though, following a screening protocol reflective of the issues in your breed and your line is good breeding practice, even when the results of some tests may not always provide nice neat answers. We owe it to our dogs, our breed, and the people who live with the dogs we produce to take reasonable precautions, including the use of screening tests, to avoid producing puppies that will at some point in life develop a hereditary health problem. Even if you haven’t observed health issues in your dogs, the potential might still be there. 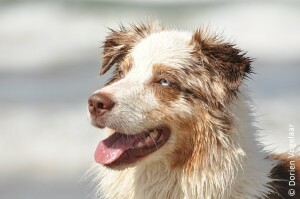 Australian Shepherds are active dogs who frequently exhibit a strong will to do some sort of work, be it the breed’s traditional stockwork or the plethora of more recently adopted activities people enjoy with their dogs. People who keep their dogs really active often assume that if they can work or perform, there can’t be any problem. But a high-drive dog may also have a high pain threshold, or the dog may be so focused on the activity it pursues that it will work in spite of pain. You cannot manage common pain-causing conditions like hip or elbow dysplasia in a breeding program without a thorough screening regimen for breeding dogs. Collie Eye Anomaly (CEA) isn’t much on anyone’s mind anymore even though it was a frequent issue in the 1980s and early 1990s. Research published in 1991 established that the disease in Aussies was a recessive. Those breeders who had the issue took steps to breed away from it. Recently it has begun showing up more frequently, possibly because it has fallen off most breeders’ radar. Most of our dogs’ inherited health issues are far more complex in inheritance than CEA and the only way to know for sure if there is risk in the pedigree is to know as much as possible about your dog’s direct progenitors and other near relatives. Unfortunately, that information can be hard to come by. Some people won’t share health information, others will outright lie, and a few unscrupulous souls will even resort to fraudulent practices by slipping in a ringer for a screening exam, or even a DNA test, if they know their dog won’t pass. The really creative may forge certificates. A good rule of thumb is: If a breeder is known to be unscrupulous, don’t deal with him, no matter how good his dogs are or how often he wins. Sources of reliable health screening data, like the Orthopedic Foundation For Animals’ health database or those operated by some European kennel clubs can be extremely helpful. Even so, you can’t assume that no information on your dogs’ relatives means you are in the clear. Where reporting screening results is voluntary some breeders may elect not to list affected dogs with the registry. If a relative has not been screened or the results of that screening aren’t shared, you have no idea whether the dog is clear or not. There is another devil we don’t know when it comes to health: Ourselves. Almost everyone in this game is there because they love dogs. Our own dogs are very special to us. They are our companions, members of the family and partners in our activities. When something goes awry we can let our feelings cloud our reason. If the dog is a breeding animal, discovering that it has or carries a health problem can feel like a blow to the gut. Denial is a normal emotional reaction to bad news and every breeder should be aware of this for her dogs’ sake. When something unwanted happens with one of your dogs audit your reactions and behavior to make sure you aren’t fooling yourself. If you have any doubt, there is no doubt: Do the necessary screening tests and take the appropriate steps to minimize the risk to your dogs and the breed. If you don’t look at the trees in the forest, are they really there? For most of the history of the Australian Shepherd, nobody checked for elbow dysplasia. In the US elbow screening still isn’t common. With ED, it’s easy to convince yourself that there is nothing wrong if you aren’t screening. Some affected dogs show no sign of elbow pain, others only have occasional front-end lameness which may shift from one side to the other. If your dogs are regularly involved in vigorous physical activity through work or competitive training, the occasional minor limp is easy to dismiss as a minor sports injury. When the Aussie population began to grow in Europe, where elbow exams are as expected as those for hips, cases started turning up regularly. I have been gathering health data on Aussies since the mid-1980s and for a long time had little information on elbow dysplasia in the breed. But when I first started getting data from the Swedish Kennel Club’s on-line database, there were roughly the same number of dogs listed as having ED as those with hip dysplasia. These dogs were not all related; their pedigrees included many of the lines available in Sweden at that time. This indicated that our failure to do elbow screening on our side of the Atlantic is missing a disease that has been under our noses for a long time. Elbow screening is one of the exams required for Canine Health Information Center (CHIC) certification through OFA. Even so, it still isn’t standard practice when it should be. When you don’t bother to look for something, odds are you aren’t going to find it. Sometimes a breeder who might otherwise do screening tests might skip one because he mistakenly thinks his dogs are clear. There are a variety of diseases that were once cumulatively referred to as Progressive Retinal Atrophy (PRA.) Now that scientists can track down the individual genes that cause disease they have discovered that there are several genetically distinct types. PRA of any type is rare in Aussies, but most of those who do have it have the progressive rod-cone degeneration (prcd) form, which is what people typically test for. However, centralized PRA and other retinal diseases have been reported in Aussies and tests are available for some of these. Failure to do annual eye exams through at least 10 years of age, or assuming that any retinal defect found can’t be inherited because the dog or its parents have cleared the prcd test has the potential to result in increased frequency of those other and presently rare forms of retinal disease because breeders are makng mating choices based on false assumptions. Given the multiple forms of PRA, if an Aussie is diagnosed with the disease it would be wise to confirm the diagnosis by having it tested for prcd (which Optigen, the lab offering the test, will do for no charge.) If the test confirms the diagnosis, breeding relatives need to have the test, too, so their status is known. If a dog with a PRA diagnosis does not have prcd, Optigen will also screen the sample to see if it might have one of the other forms for which they have a test. This attitude allows those who employ it to cloak themselves in a comfortable blanket of denial and avoid the inconvenience of doing disease screening that may alter their breeding plans. While test results may mean you ought not to breed certain dogs having those results, especially from DNA tests, enables you to make informed breeding decisions that could help you breed away from disease at issue. DNA tests are becoming more and more common. They are more useful for a breeder than other types of screening tests because they reveal the dog’s genotype: You know exactly what gene forms the dog can pass along. Initially, the tests were for simple dominant or recessive mutations. The results revealed the dog’s genotype and enabled breeders to avoid producing affected offspring by not doing crosses which could produce them. But as time went by, researchers began identifying genes that were not so simple. Many of these confer risk factors: Their presence does not necessarily mean the dog will get sick but rather that it has a heightened chance of doing so. Because these tests don’t offer black-and-white results, some advocate not using them at all. This is yet another form of denial. Results showing the presence of this type of mutation, even in a double dose, don’t necessarily mean the dog should be washed out of a breeding program. How frequent is this mutation in the breed? Is the disease potentially lethal or does it cause serious quality of life issues? While dogs affected with serious diseases ought not to be bred further, often – depending on the specific disease – healthy dogs, even with two copies, might be bred to clear-tested mates. Within a few generations the mutation can be significantly reduced in frequency or, if it is uncommon, eliminated entirely. With the tests for these risk-factor mutations a breeder is in a far better position to decide the best crosses to make to avoid the disease. You can set yourself up for an unpleasant surprise by assuming that breeders who do a screening test, particularly one that isn’t considered more-or-less standard in the breed, are the only ones whose dogs have that disease. Those who are most scrupulous about screening tests are frequently the same people who will be most open about health issues they have encountered in their dogs. Their diligence and honesty may give the misleading impression that their lines have more problems than others simply because the information has been made available. Those who don’t bother to screen, or claim they’ve never had any problems may simply not know because they don’t check or follow up on dogs they’ve sold. And there are the few hard cases around who spear tar on the ethical to advance their own agendas: The deliberate, and often loud, dissemination of innuendo and disinformation is an effective way to redirect attention away from one’s own issues. The truth is, screening tests can be very useful breeders’ tools. They are not all one in the same and you need to educate yourself about what the results mean, both for the health of the dog and for your breeding program. You also need to know which tests should be standard in the breed and which used only in certain circumstances. If the latter, know what those circumstances are. Far better to get unpleasant news then proceed based on that knowledge than to avoid screening and blindly hope for the best.